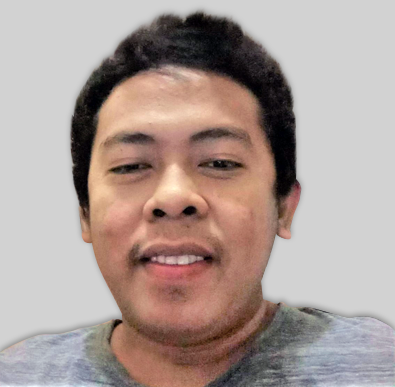 Can you please add this to the form titled "Social Ice" ASAP? I don't want to mess it up. I have added the condition in your Social Ice form. Kindly check. 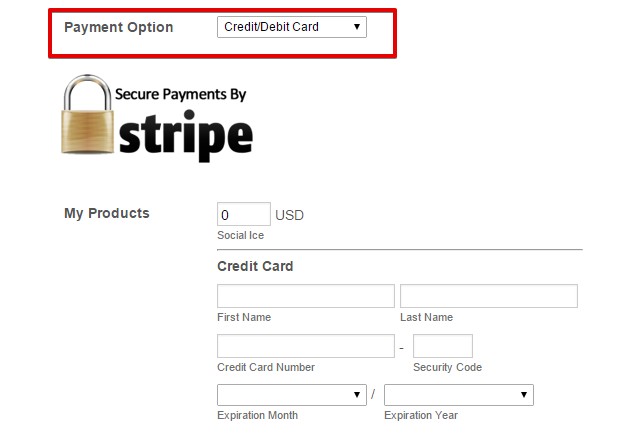 Since this form doesn't have a "Payment Option" dropdown field like your other form, I have added it for your convenience. Then I have applied the condition as per your request. Thank you very much for your help. I just received my first order. The customer noticed there wasn't anywhere to put apartment or suite number. Is there anywhere we can add this? Since the form http://www.jotform.us/form/53056493768164 was setup to use Custom Payment Amount the item/products will not be included in the description of the payment. 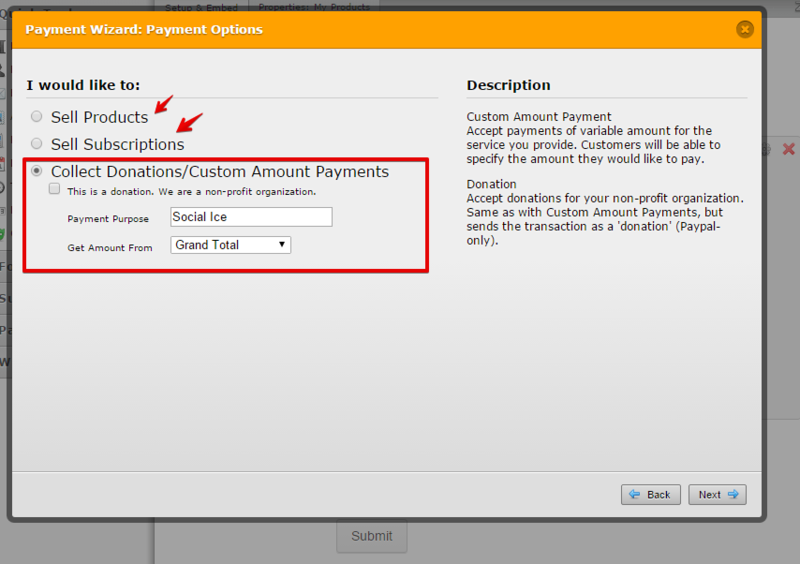 Please take note that the payment setup is not similar anymore to the setting when creating Products or Subscription Payment Form. Hope this is clear. Let us know if there is more we can help you with. Yes I noticed that. Why is that the case? If there is no way to change this, I will have to manually send an email to the customer summarizing their order. Also, after a customer submits an order, is there any way I box can pop up that says "Thank you for your order!" or something along those lines? I only want this to happen if the order is successful. I still want the customer to go my home page (like my form is set up to do now after an order is submitted), I just want a box to pop up on that page. Unfortunately, it is not possible to add a pop up message, you could however setup a summary order on the "Thank You" page but I see that you want to redirect your users to a different link after clicking the submit button. 1. 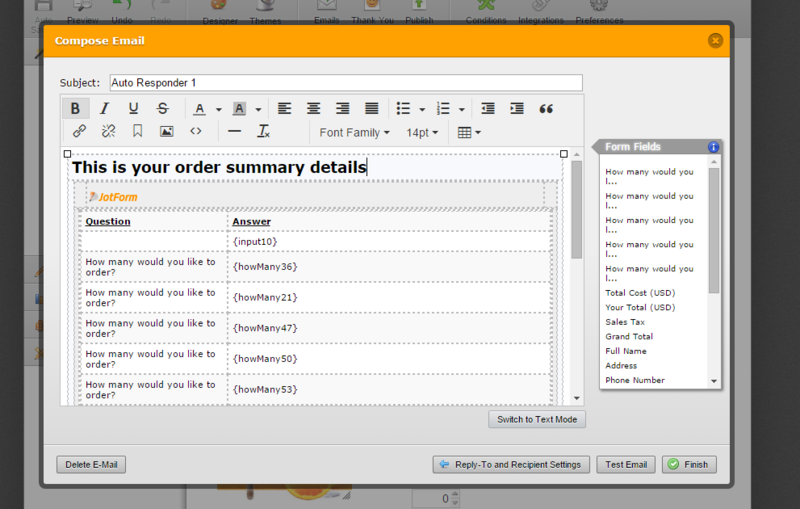 You can create an autoresponder and have the summary order details of the user there. Here's a guide on how to create that: http://www.jotform.com/help/26-Creating-a-Form-Autoresponder. You can edit the email body, you can rewrite the text and choose the form fields to show in the email template by clicking the form fields at the right side panel. 2. You can send post data to your landing page and show the user's summary of order. However, you'll need to have a PHP script to catch the post data variables. Here's a guide on how to send post data: http://www.jotform.com/help/213-Send-POST-Data-From-JotForm-Using-PHP-in-Custom-Thank-You-Page. 3. You can also use the send post data to fetch the order details and display it on pop up box on your website page. But this will be done in your website's specific page and not on JotForm if you want to redirect. Is there a way to make my logo smaller at the top of the form?